You are invited to a pioneering, innovative conference that focuses on cutting-edge developments occurring in the tourism fields. The Adventure and Beyond Go North Wales Tourism Conference will be held at Pontio Innovation Centre, Bangor, December 6th 2018 from 9.30 – 16.00. 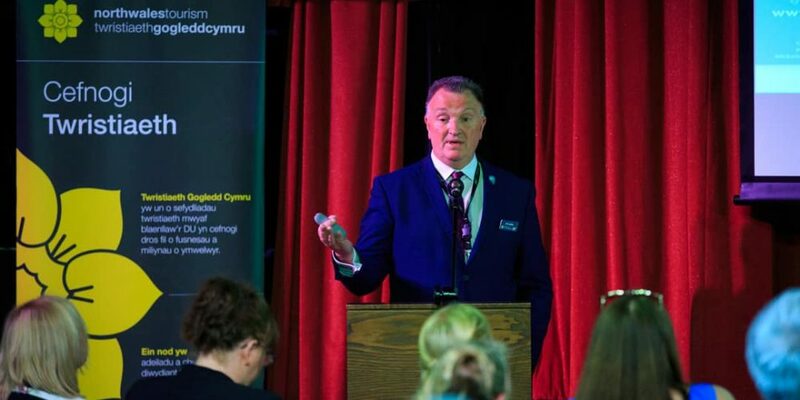 The Conference will be hosted by North Wales Tourism in partnership with Arloesi Pontio Innovation will bring together market leaders, tourism businesses and the captains of our industry from across the UK. This year’s theme will be “Innovation, Discovery and Wellbeing”. The dramatic, rapid, and concurrent growth of tourism industries creates both tremendous opportunities and challenges. Kate Humble is a writer and television presenter specialising in live and factual programming. Her television series include Back to the Land, Animal Park, Arctic Live, Lambing Live, Springwatch, Yellowstone, Off the Beaten Track, Extreme Wives, Living with Nomads & Wild Shepherdess. She also presented the award winning comedy game show Wild Things, wildlife quiz Curious Creatures and has made guest appearances on Would I Lie to You, 8 out of 10 Cats & Countdown. John Thackra is a British-born writer, advisor and public speaker. He curated the celebrated Doors of Perception conference for 20 years – first in Amsterdam, later across India – and is a Senior Fellow at the Royal College of Art in London. Thackara writes about live examples of what a sustainable future can be like with a special focus on social and ecological design. For more than thirty years John Thackara has travelled the world in his search of stories about the practical steps taken by communities to realize a sustainable future. He writes about these stories online, and in books; he uses them in talks for cities, and business; he also organizes festivals and events that bring the subjects of these stories together. Come to hear inspirational and influential speakers talking about their experiences. The event promises to be the best yet.